Despite being included in the Albuquerque Metropolitan Statistical Area, the most populated area in the state, Torrance County has the relatively small population of about 17,000. 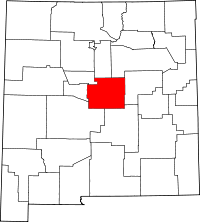 Only a small percentage of that population resides in the county seat of Estancia, NM, which is one of only a few towns and villages in the county. That town is home to the County Clerk, the local custodian of public records which include taxes, real estate, marriage, and others. The nearby District Court maintains all court records, which includes criminal and civil cases such as divorces. A number of local Catholic churches have records on file, as well, including baptism, death, and marriage records. Many of them date from the mid 1800s to the mid 1900s, and all are preserved on microfilm for research. In many cases, local churches began compiling records long before local government agencies were established.